One of seven Democratic candidates vying to unseat Republican U.S. Rep. John Culberson, Laura Moser says that opposition from inside her party has helped her raise more than $60,000 in two days. 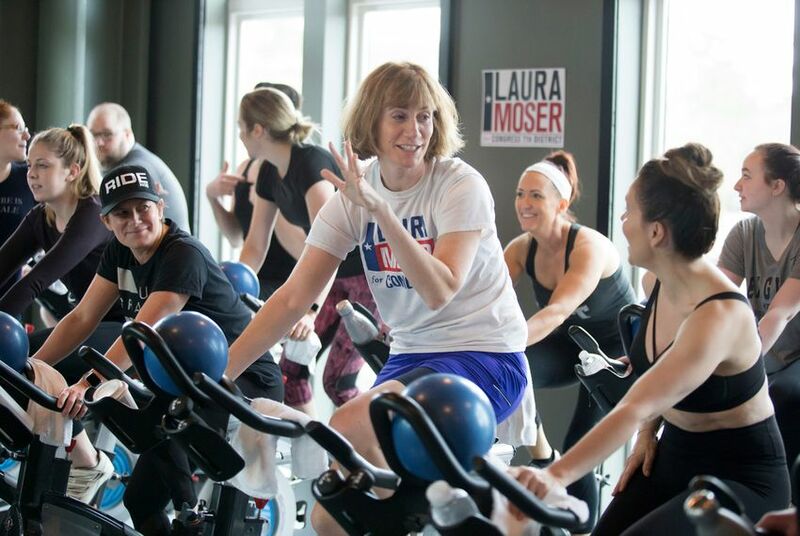 HOUSTON — Democratic congressional candidate Laura Moser packed her Saturday with campaign events: attending a spin class in the morning, drinking mimosas shortly after, block walking in the afternoon and hosting a “Vote Your Values” rally to finish things off. And at each stop, she did not shy away from the elephant in the room. Raising her voice to be heard above cheers and applause from her supporters, Moser announced that since national Democrats came out against her on Thursday, she has raised more than $60,000 — as well as received flowers and eight free meals. This week the Democratic Congressional Campaign Committee posted negative research on Moser, a Houston journalist who is one of seven Democrats in the March 6 primary hoping to unseat U.S. Rep. John Culberson, R-Houston. The DCCC research notes much of Moser’s campaign fundraising money has gone to her husband’s political consulting firm and that the candidate only recently moved back to Houston. It also labels her a “Washington insider.” The posting follows concerns from Democrats locally and nationally that Moser is too liberal to win a historically Republican district. On Saturday, Moser was joined by actress and activist Alyssa Milano on the campaign trail. The candidate used the events — which campaign workers said drew many more supporters than expected — to stand by her progressive stances like supporting single-payer health care and campaign finance reform. In light of the recent Florida high school shooting and Hurricane Harvey's impact on residents in the district, Moser said she is also discussing with voters her plans for common-sense gun-safety legislation and repairing infrastructure. Milano, who is known for her roles on “Project Runway All Stars,” "Charmed” and "Who's the Boss?,” has emerged as a powerful liberal political voice in the post-Trump era over social media. She was also involved with Democrat Jon Ossoff’s congressional campaign in the 2017 Georgia special election, which he lost, and the #MeToo movement. Milano told The Texas Tribune she found out about Moser’s strong, progressive views through Twitter. Moser had previously founded Daily Action, a text-messaging program that gives hundreds of thousands of frustrated progressives a political task to complete every day. And despite the DCCC posting, Milano said she will continue to support candidates she believes in. Milano has also disagreed with the endorsement that influential national group EMILY's List gave the more moderate corporate lawyer Lizzie Pannill Fletcher — who was also one of two Congressional District 7 candidates endorsed by the Houston Chronicle. She told The Intercept that the group “missed the boat on this one,” as evidenced by the success of Moser’s grassroots campaign. On Thursday, Moser’s campaign announced it had raised nearly $150,000 in the first 45 days of the year, a number that has been growing after the DCCC’s posting. The candidate said on Saturday that she has received more than 15,000 unique contributions and more than 1,000 volunteers have signed on to her campaign. Moser has also amassed a massive online following for a first-time congressional candidate. Many of her supporters are also fans of U.S. Sen. Bernie Sanders, who unsuccessfully sought the 2016 Democratic presidential nomination. Volunteer Amy Tabor, who has worked three months for the campaign, block walked for the first time since the DCCC announcement with dozens of others on Saturday. She said few voters brought up the news, preferring to talk about how Moser would minimize devastation from future natural disasters, but those who did were unhappy with outsiders in D.C. dictating what Houston voters should care about. For Moser, the long campaign day ended with a cozy rally in Firehouse Saloon and Badlands Radio, a Houston events venue with wooden tables, pillars and a stage which the candidate’s staff generously decorated with “Laura Moser for Congress 7th District” signs. Over the chatter of more than 100 people and the upbeat music from local band “no rehearsal,” Moser repeated her intention to keep running a positive, values-oriented campaign.